That’s all scientists believe remains of the North Atlantic right whale population. Due primarily to human impacts, the population of these endangered whales has been in decline since 2010. North Atlantic right whales were once called the “right whales to hunt” because they swam close to shore, produced high yields of whale oil and baleen, and—thanks to their thick blubber—floated when killed. But now, rather than whalers, the population faces threats from vessel strikes and entanglement in fishing gear. This week at its annual conference, the North Atlantic Right Whale Consortium (NARWC) released its annual “report card” on the status of this endangered population. Population numbers are reported at the end of the year once numbers are analyzed, so the most recent complete report available is for the end of 2017. The best estimate for the population at the end of 2017 was 411, and there have been an additional three documented mortalities in 2018. 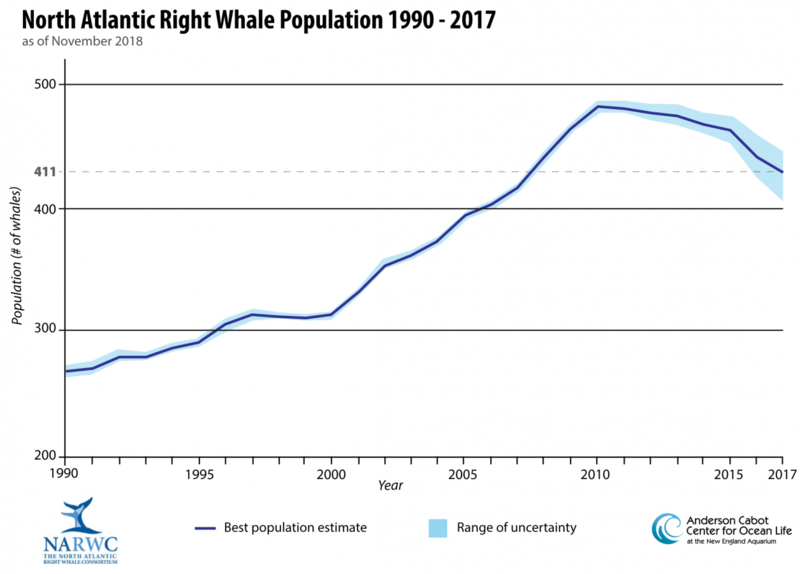 A graph of estimated North Atlantic right whale populations from 1990 to 2017. The dark blue line represents scientists’ best estimate for the population number, where the light blue area represents the range of uncertainty. With 95 percent confidence, scientists report a right whale population between 392 and 433 at the end of 2017, with a best estimate of 411. Data from the 2018 NARWC Report Card. From 2000 to 2010, the species seemed to be on the right track—its population was growing. By 2007, the population had increased from about 350 to 419, reaching a high of fewer than 500 whales in 2010. “We’re eroding that population growth,” Mark Baumgartner of Woods Hole Oceanographic Institution said at the Consortium meeting. The last few years have been desperate for right whales. 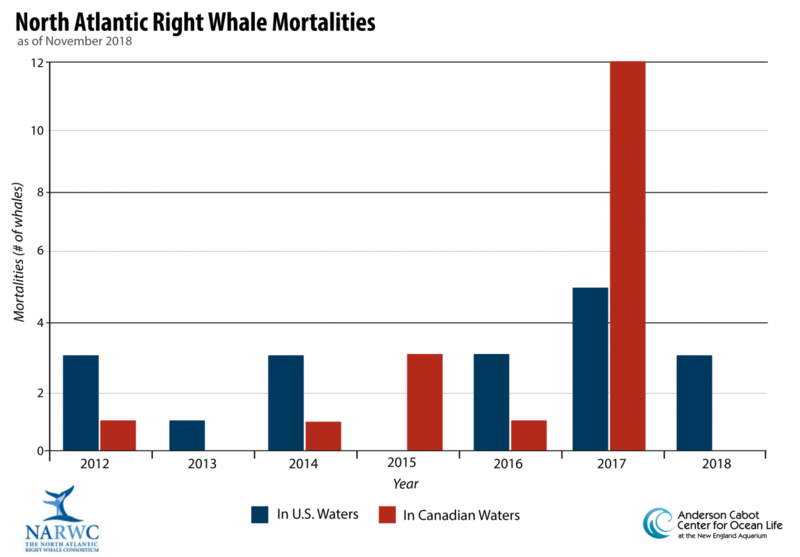 The unprecedented 20 right whale deaths over 2017 and 2018 represented a loss of more than 4 percent of the struggling population. In 2017, 12 deaths were reported in Canadian waters and five in U.S. waters. So far in 2018, there have been three reported mortalities, all in the United States. Right whales have a range from the east coast of Florida in the United States to the Gulf of St. Lawrence in Canada. Mortalities are reported either in U.S. waters (dark blue) or Canadian waters (red). Data from NOAA Fisheries. 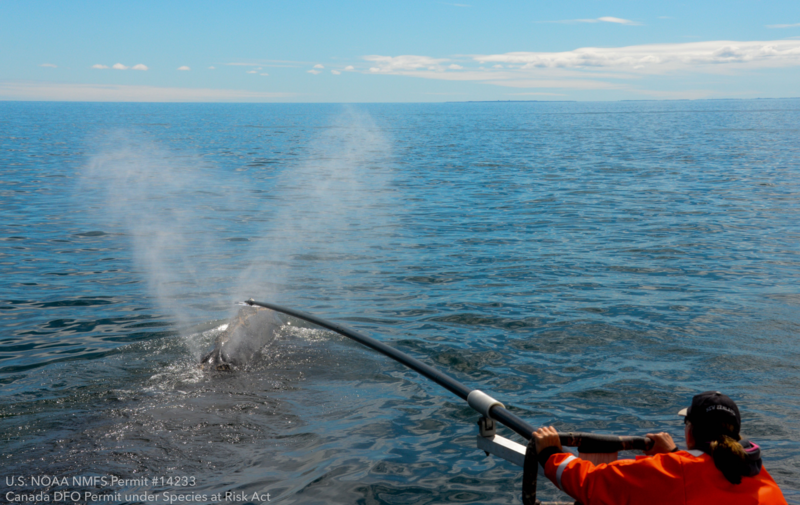 This spring, Canada implemented new measures to help mitigate both entanglements and vessel strikes in areas right whales are frequently seen. The Canadian measures included vessel speed reductions, the establishment of different types of fisheries management areas and closures, and increased reporting. Under the new measures, the Canadian government increased reporting requirements for fishing activity, lost gear, and interactions with marine mammals. While there haven’t been any right whale mortalities reported in Canadian waters this year, there were three reported entanglements in Canada. Additionally, all three of the 2018 mortalities, which were in U.S. waters, were attributed to entanglement. One of those entanglement deaths was from Canada snow crab gear. Continued timely and effective efforts to reduce both entanglements and vessel strike mortalities must be a priority for both the U.S. and Canada if the species is to survive. An important note: This is a preliminary release of the report card. Any additional data through the end of 2018 will be updated in January, if necessary. Entanglements and vessel strikes have plagued the right whale population. According to the NARWC Report Card, “It is clear that current management regulations have not been effective at reducing serious entanglement injuries.” Between 2010 and 2016, 85 percent of right whale mortalities were related to entanglement. When a whale is entangled, it doesn’t die instantly. Instead, entanglements in fishing gear—mostly the heavy ropes and traps of snow crab and lobster gear—reduce the survival probability for whales by exhausting and slowly starving them. Some whales, thankfully, manage to shed their gear, but their brush with entanglement leaves literal scars that scientists use to identify the whales. A total of 83 percent of right whales have been entangled at least once. “Human-caused mortality is unsustainable in this species,” said Baumgartner. The fewer documented mortalities in 2018 doesn’t make up for a big issue within the population. Right whales aren’t having babies. In 2018, for the first time in the 38 years Aquarium scientists have been studying the population, there were no calves reported. Number of calves born (light blue) compared to known reproductive females available to calve (dark blue). The orange line is the percentage of females available to calve that gave birth from 2009 to 2018. Data from the 2018 NARWC Report Card. Of the 411 individuals in the right whale population at the end of 2017, the report card says there were 71 female right whales available to calve. “Available females” are females who have given birth to at least one previous calf, were presumed to be alive, and who had not not given birth in the last two years. The amount of available females has been either steady or increased, but the percentage of those females giving birth has dropped. There are fewer right whales giving birth. Anderson Cabot Center Senior Scientist Amy Knowlton studied the effects of severe entanglement on the females of the population. She found that within three years of a severe entanglement, only about 33 percent of females survive. Across the entire population, moderate and severe injuries from entanglements are on the rise. At the Consortium meeting, there were calls for working with industry representatives to help save these whales. The thought is that fishermen are worried about reporting entanglements they see because they’re afraid it could negatively impact their livelihoods. “If we’re going to solve this problem, we need the data,” said Moira Brown, Anderson Cabot Center Senior Scientist. Since 2004, the Consortium’s annual report has included updates on this beleaguered population, information on mortalities and injury events, a summary of management and research efforts that occurred that year, and—perhaps most important—recommendations for the future. The NARWC said that identifying new critical habitats and developing alternative survey efforts to respond to these distribution changes needs to be a priority. “These strategies should include efforts to not only locate and identify individual right whales, but also to ensure that information critical to important monitoring and management efforts … is effectively and efficiently collected,” according to the report card. The Anderson Cabot Center is a critical component of the North Atlantic Right Whale Consortium, which is led by our very own Heather Pettis. For nearly than 40 years, the New England Aquarium’s Right Whale Team has been leading research on and advocacy for the species. The team conducts vital work, including cataloging right whales in its extensive DIGITS database, tracking pregnancies and birth rates, investigating fishing gear adaptations to prevent entanglements, working to reroute shipping lanes to prevent deadly vessel strikes, and conducting groundbreaking stress hormone research in whales. The day before the Consortium meeting, Anderson Cabot Center scientists joined industry leaders, engineers, scientists, and policymakers at the Ropeless Consortium Meeting. This group has a simple though not easy goal—a future with no ropes in the water column and, therefore, no whale or turtle entanglements. Thanks to a recent federal grant of $225,000, Senior Scientist Dr. Tim Werner and his team will begin testing a type of “ropeless” gear that replaces vertical rope lines with a large floating spool. Together, we are working to ensure the long-term conservation and recovery of the endangered North Atlantic right whale.